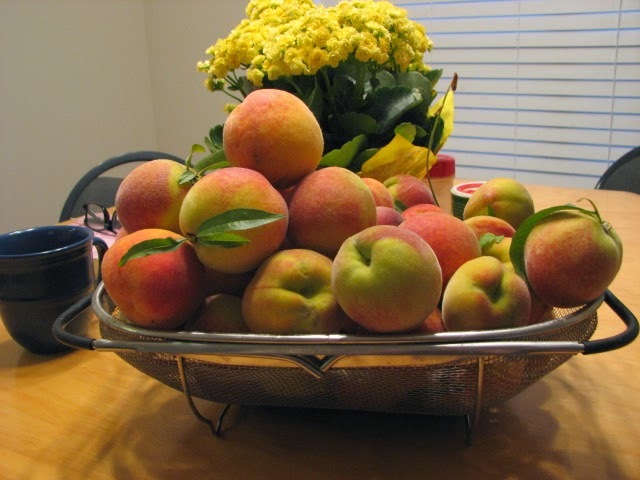 In this post, I was pondering what to do about my peach tree since we are moving. Dave, from Our Happy Acres Blog, had given me the wise advise that moving a large tree would probably kill it. 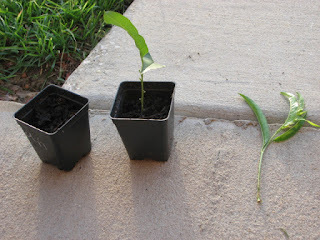 I contacted David The Good from Florida Survival Gardening about the possibility of grafting (since he is a grafting guru) and he said it could only be done when the tree was dormant. That is not good for me, since our house is currently on the market and we hope to sell it before summer ends and certainly before the tree goes dormant again. So I kept pondering. What to do? What to do? Was there no way to keep a tree that has been so good to me? And finally I came up with a couple of solutions. They are amazing to me in their simplicity. The first thing I decided to do was to save several of the seeds and plant them. I had a few drops I had missed, so the seeds were available. Even though it would have been smarter and easier to just carry the seeds and plant them at the new place, I didn't think that far ahead. I planted them in some good garden soil. Impatiently, I dug up one of them to see what was going on. It had tiny rootlets. So maybe. The other thing I decided to do was to take cuttings from the tree and try to root them. My grandmother used to root anything and everything. So it seemed worth a try. I bought rooting compound and set out to try. In case you have never done any rooting before, I will go through the easy steps. 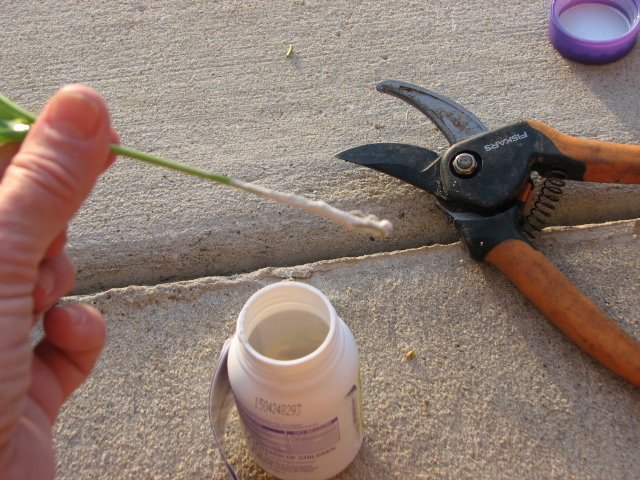 Cut a small piece from your plant of choice, going down to the place it forks from the other branch. Then remove the outer layer of bark, exposing the cambium wood. I use my fingernail so that I won't go too deep. 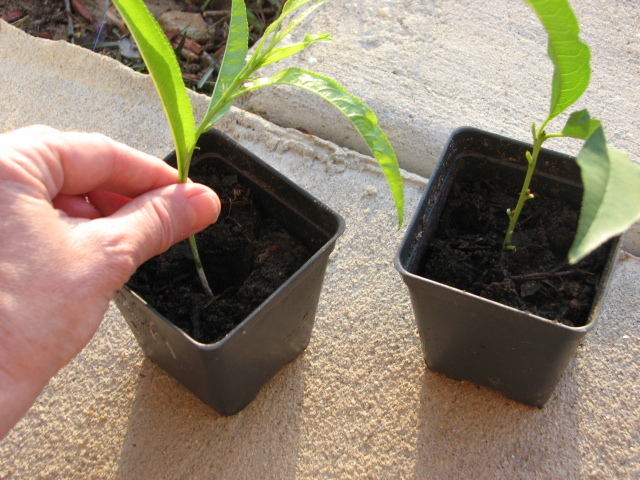 Remove all the lower leaves, leaving just a few (one or two is enough) at the very top. Dip it in the rooting compound. Put it in a prepared pot and keep damp. Maybe I'll be able to get peaches at the new place now. I don't have time for a long post. I took almost the entire week off from my work preparing for our move to deal with our peaches. This week I have to get back on track with the stuff for the move. Despite that, I did want to update you on the peaches this year. We harvested 57 pounds! What a great tree! Since this will be the last home grown peaches I have for awhile, I wanted to make sure I got as much jam as possible. I ended up with 23 pints. 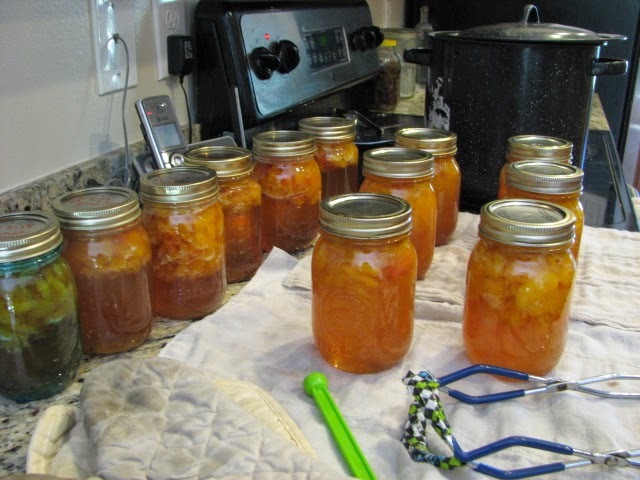 I found a recipe for peach peeling and pit jelly and made that with a gallon of the peelings and pits. That gave me 5 pints of jelly. So I feel pretty happy about the harvest. Linking with Daphne's Dandelions for Harvest Mondays. I always love peach season! 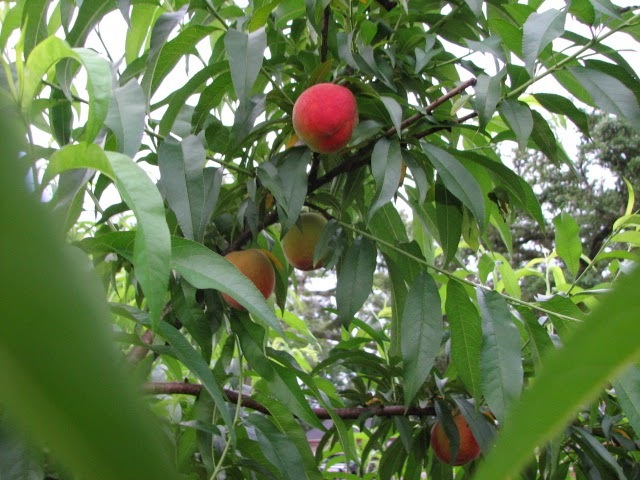 I have a Feliciano peach tree. This is a very early peach tree that produces well with low chill hours. 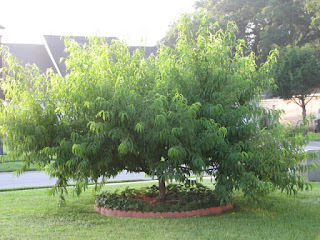 Last year, I harvested 71 pounds of peaches from this wonderful tree. Last year was much colder and I began harvesting on May 2, 2014. 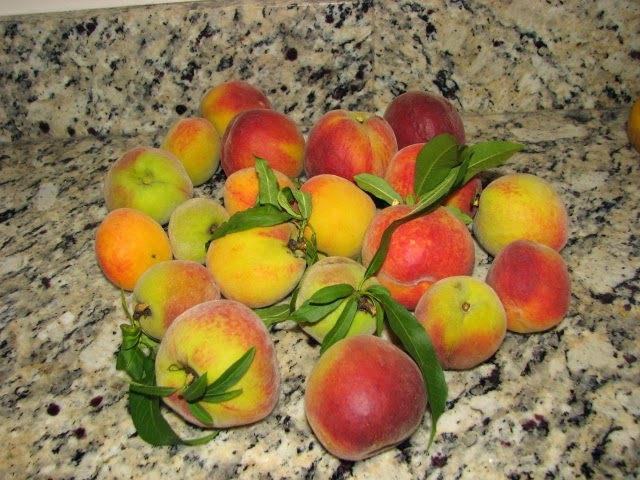 This year, I began harvesting Friday, April 24, 2015, but those first peaches were eaten immediately by my children and me, so there is no record of those. I am very excited about the fruitfulness of this tree. The only bittersweet part of this is that my family has decided to sell our home. We are hoping to move to land. That's our goal. It's great to get more land, but leaving this tree is hard for me. It's a huge tree and would need a crane to remove it from the land. I have a friend who is keeping many of my other plants until we can get settled into our land. She would be willing to plant it and keep it for me, if anyone knew of a way to save the tree for our future use. Thank you in advance for any advice. I am happily linking with Daphne's Dandelions for Harvest Monday. I really appreciate her long-standing devotion to the community of bloggers on Harvest Mondays through out the years. 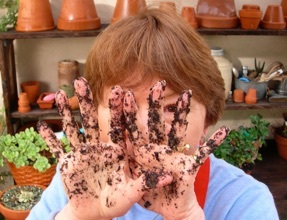 It has been great to read about gardens, even when I am too busy to do much gardening. I love flavored coffee creamer, but lately I have been on a kick to save money. And I don't like all the unpronounceable things in the flavored coffee creamers you can buy. I went on the Internet and looked up recipes for flavored coffee creamer, but all the ones I could find required that I buy something ELSE. I wanted a recipe that used items I already have in my cupboards. I decided to make use of the years of cooking in my history to come up with something that would work for me, with the ingredients I have on hand. 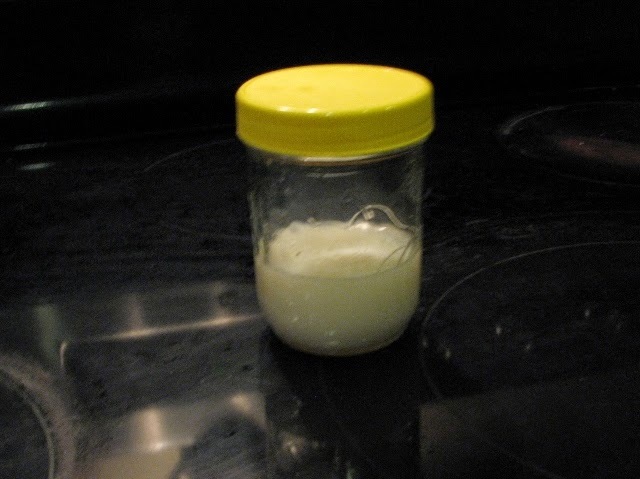 1 pat of butter/margarine/coconut oil (about the size you would put on a piece of toast) This is for that creamy mouthfeel store bought creamers have. In a saucepan, mix the top 4 ingredients and cook until it steams. (If you cook it too long, it will get really thick. It still tastes good, but has to be spooned into the coffee, instead of poured.) Then add the flavoring of choice. It helps to use an immersion blender to really mix up those powdered milk solids so they will be smooth. Pour into a jar and keep refrigerated for your morning coffee. I also added a pinch of nutmeg one time. I like that little more complex flavor, as well. It's a really cheap recipe, so try it out. Mix it up to your tastes. For 20 years, our municipality has collected Christmas trees and then mulched them, giving out the mulch for free to residents. This is the first year that we made a point to participate in this windfall. My son and I went down to the fairgrounds. The nice people loaded it, and smoothed it. We didn't even have to get out of the truck. We were only responsible for the unloading. It started with more than this, but I forgot to photograph it until we reached this point in the process. 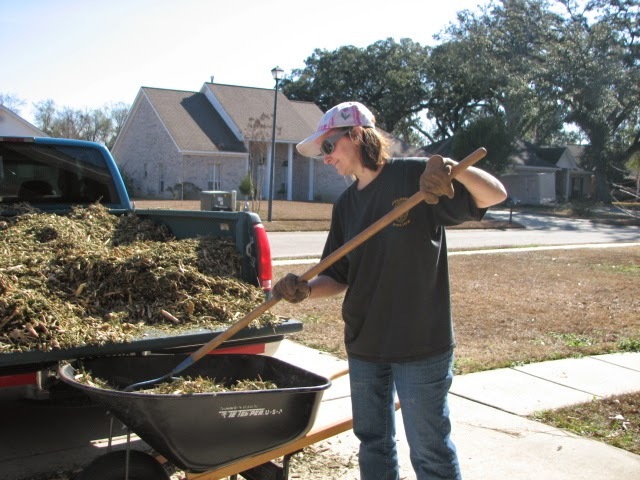 Filling the wheelbarrow, to put the mulch in our back yard gardens. 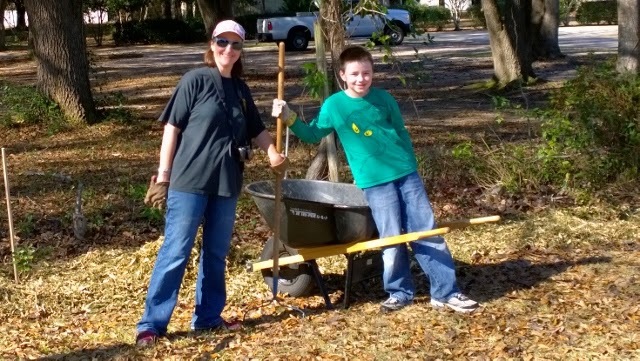 My son and I posing as we put the mulch in the back yard. We ended up with enough to go around every tree that lines my property line. Next year, we might come home and drop the load and go back for a second load. The people said that it was fine to do this. We didn't know how much we would need or how long it would take us. We also didn't know how much energy we had to devote to the project. We know for next year! 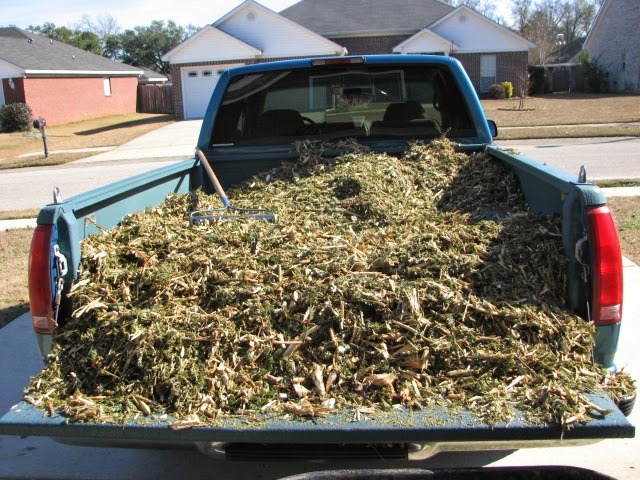 It was a wonderful blessing to us, saving us somewhere in the area of $400, had we used purchased pine bark mulch for the same area. And it is so good for the environment, re-using what would otherwise go to the landfill, and avoiding all those plastic bags that would have been on the pine bark mulch. Win! Win! I don't always plant a fall/winter garden, but when I do I am always reminded of how nice it is to have a winter garden. The crops are so much easier maintenance than a summer garden. And the flavor of fresh picked broccoli and English peas is divine! 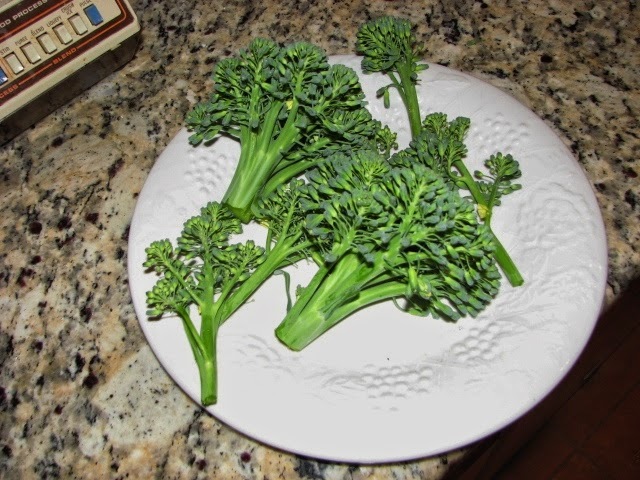 This year I have broccoli, which we are harvesting at least 3 times a week now. We have English peas, which are just starting to produce pods, Then there is Swiss chard, which I love, and am so glad to have in the garden again. I had really missed eating Swiss chard. I also have 3 cabbages, which look really good. I tried to grow 2 types of onions from seed. The seeds all sprouted and looked good until I transferred them into the garden. Now I have 2 little sections of about 10 onions in each. I don't know what happened. There were probably 100 of each variety before I transferred them to the garden. Maybe I didn't water enough. I don't know. I also planted some garlic, which looks great. I hope to plant some bok choi and Red Flowered Fava beans next week. I may plant more Swiss chard, too. That's it for me. See what others are harvesting on Daphne's Dandelions. Happy New Year! I am starting to harvest more okra than I was. I guess it is coming into its own. The plants look really good and healthy. The okra makes me so happy! Every day I harvested some okra. 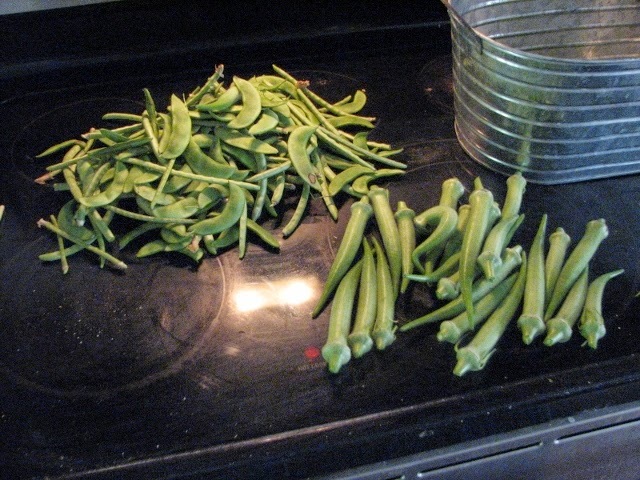 Every day I also harvested Lima beans, Mississippi Cream peas, and Ruth Bible beans. 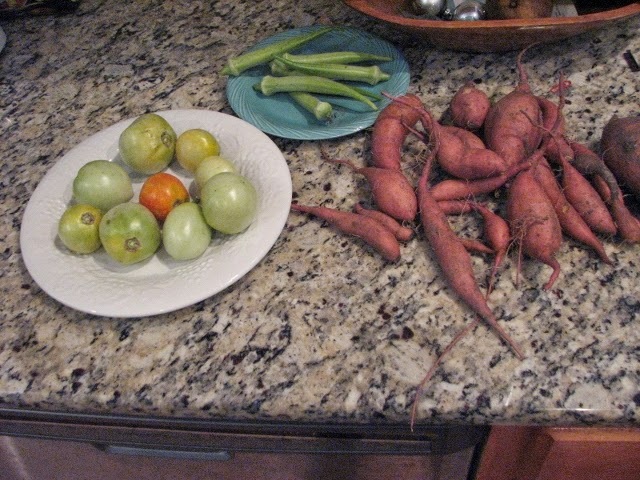 This week, the local news was talking about sweet potato harvests in town, so I harvested my sweet potatoes. They looked really good. I don't know how many I should have gotten out of the number of slips I planted, but I feel pretty happy with the harvest. 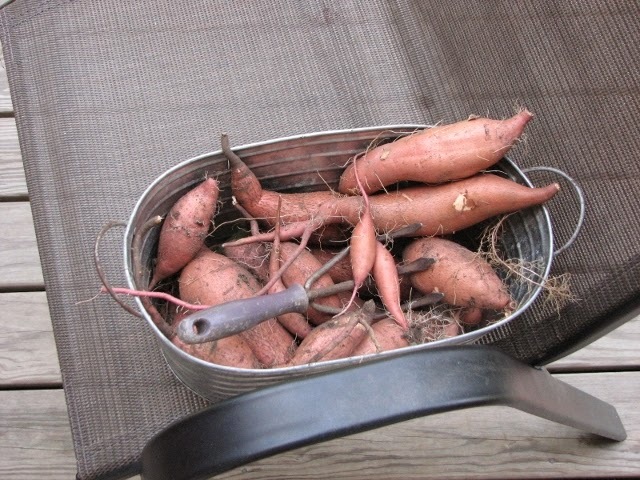 That bucket was pretty heavy and the sweet potatoes in the photo with the tomatoes are not the same sweet potatoes. I put them on the picnic table to start curing them. And then I brought them into the garage to finish curing. It was about 24 big sweet potatoes and quite a few more little bitty ones. I am linking up with Daphne's Dandelions for Harvest Mondays. Go on over and see what everybody else is harvesting! Gardening,nature, and my family are my passions. Join me on a walk through my day.